Universal 24''x12''x4'' Turbo FMIC Aluminum Front Mount Intercooler 3.0'' Inlet. Brand new universal 30.5"x12"x4.0 front mount intercooler. Made of high quality T6061 aluminum. High flow and light weight. Support up to 800HP and 45PSI. Compress air flow rate: 800cubic feet/min. Pressure drop: 0.2-0.5 at 15PSI, 2-5 at 35PSI. Full size: 30.5"x 12"x 4.0. Core size: 24"x 12"x 4.0. Professional installation is highly recommended! Item exactly the same as picture shown. PLEASE CHECK THE PACKAGE BEFORE SIGN FOR IT. 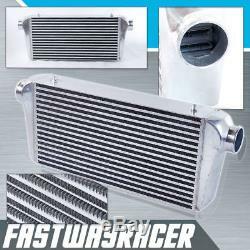 The item "Universal 24''x12''x4'' Turbo FMIC Aluminum Front Mount Intercooler 3.0'' Inlet" is in sale since Friday, March 22, 2013. This item is in the category "eBay Motors\Parts & Accessories\Car & Truck Parts\Turbos, Nitrous, Superchargers\Turbo Chargers & Parts". The seller is "fastwayracer" and is located in Whittier, California. This item can be shipped worldwide.